Home > Hallmark Ornaments By Year > 2011 Hallmark Ornaments > View All 2011 Hallmark Ornaments > 2011 Maxine Here Comes Crabby Claus! 2011 Maxine Here Comes Crabby Claus! 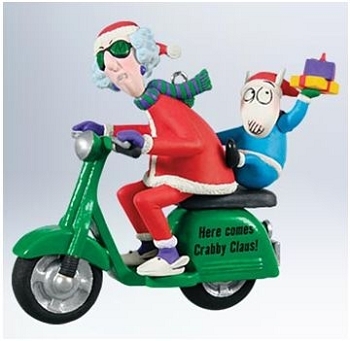 This 2011 Hallmark Keepsake ornament features everyone's favorite crabby old lady, Maxine! Maxine is on the go riding her scooter with her pal Floyd. On the scooter, "Here comes Crabby Claus!" This ornament was originally offered as a Hallmark Gold Crown store exclusive. Size: 3¾" x 3¼" x 1½"